No, I'm not talking about asking friends and family for makeup on your birthday [although, that's another way to score some free makeup]. 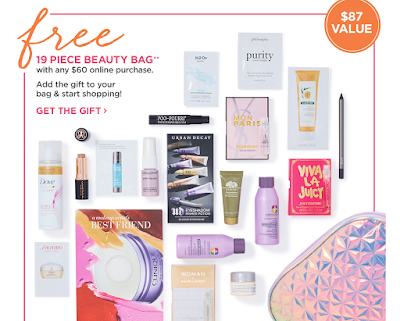 I'm talking about free birthday "gifts" from Sephora and Ulta! With every new year, there are new gift options. Sephora usually has more than one option to choose from, but you only get one (per account). The gifts are announced in January and remain the same all year long. 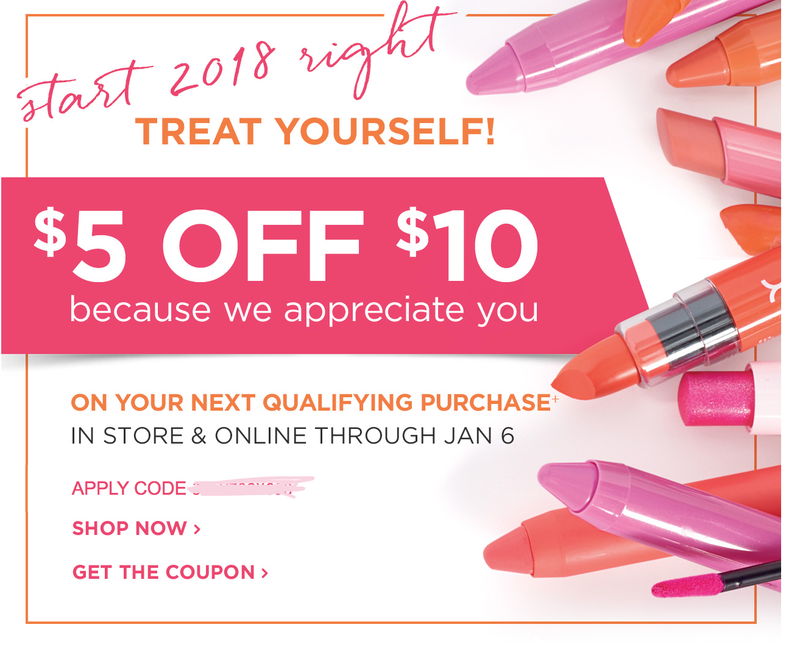 Ulta for the last 3 years, however, does "quarterly" gifts. Every 3 months, their birthday gift changes. They only announce the new gift as the new quarter begins. As long as you are a member to each store [which is free just by making an account online], then you get one "gift" in stores or online during the month of your birthday! If you redeem your gift in store, you don't have to pay for shipping and there is no purchase necessary! Just tell the cashier you'd like to redeem your birthday gift. Will update when Ulta announces their new gifts for the second quarter. As of right now, they have been rolling over the leftovers of their 2017 fourth quarter gift, which was a deluxe sample of IT Cosmetics Superhero Mascara. Platinum and Diamond members will also be receiving a $10 off any purchase coupon, in addition to the free gift. 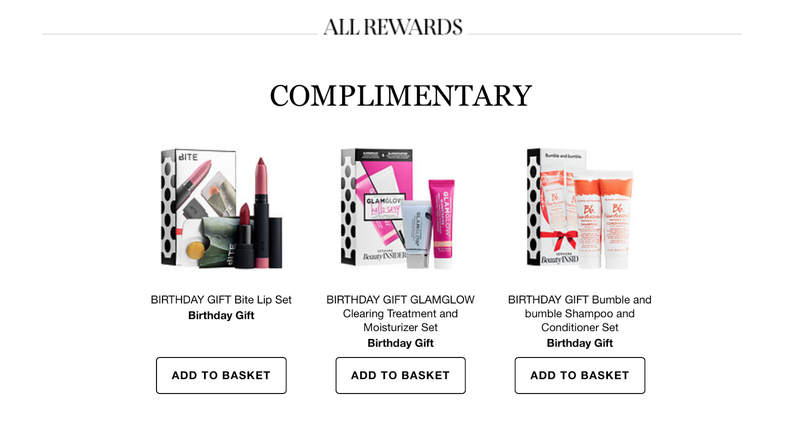 These options will only be visible on Sephora's website or app during the month of your birthday and you can find them in your Rewards Bazaar. 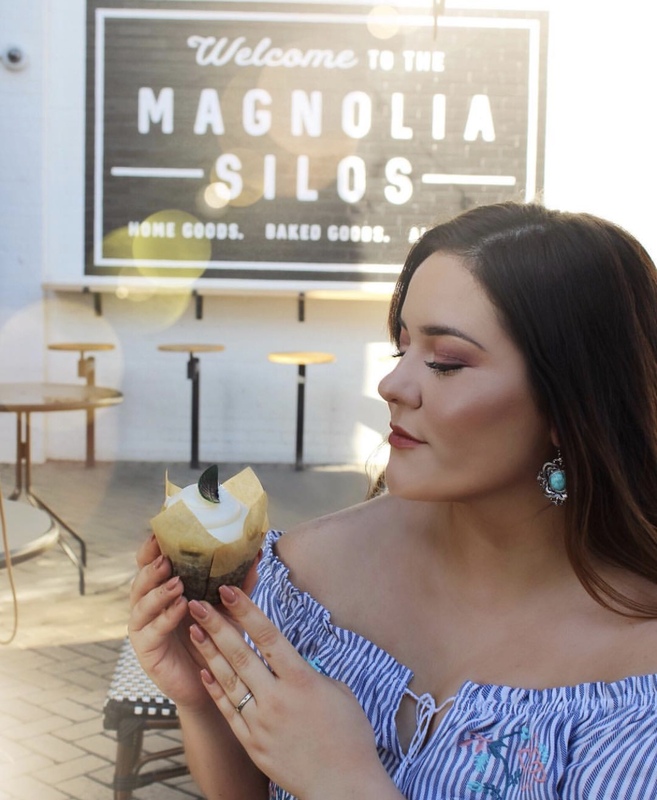 *Insert eye roll here* I know emails are annoying because if we subscribed to emails for every store we shop at, we would get thousands of emails per week. However, Ulta and Sephora's emails really are helpful! 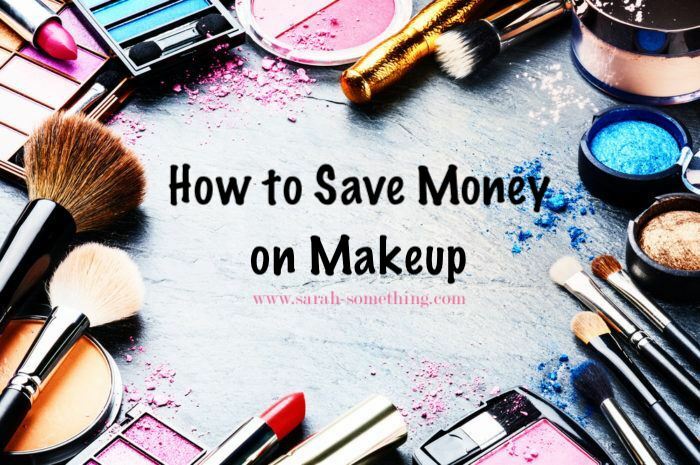 Ulta claims that they will send you over $250 in savings from coupons alone and I totally agree! 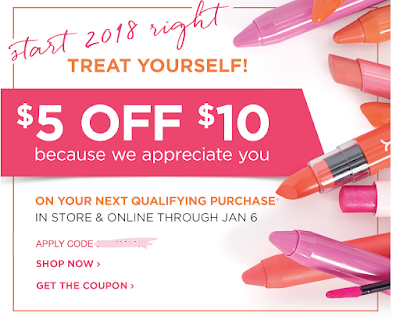 Ulta emails a copy of their weekly and monthly sales ad, which always has a coupon inside for $$ off your qualifying purchase! They are also in their paper ads in the mail, too. Not only that, but they send you random coupons, 2-5x point perks on specific brands, and gift with purchase alerts pretty frequently. If you are a Platinum or Diamond rank member, you do get exclusive email deals too. Below are some emails I have received in the last 2 weeks! Now, Sephora is a bit more stingy when it comes to handing out those deals [as we ALL know]. However, when they do have deals, your email is going to be the place where you find out. 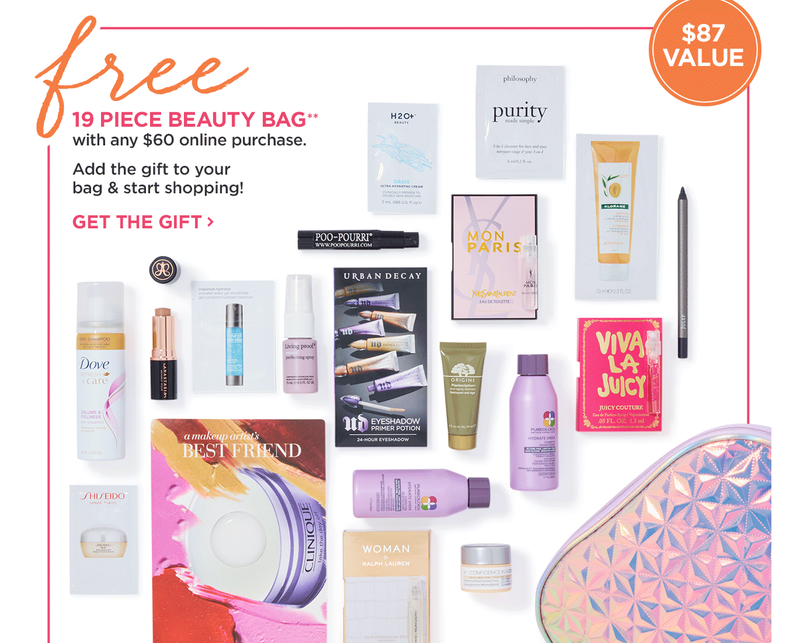 From time to time, they do send out emails letting you know about gifts with purchases, sales, promo codes, and new rewards added to the Rewards Bazaar. 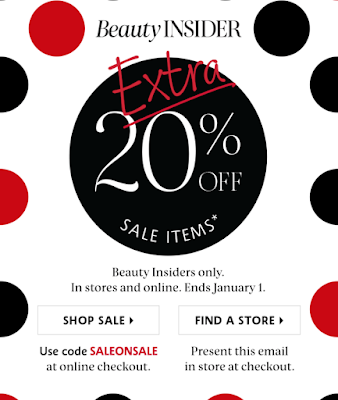 Below are some emails I have received from Sephora! 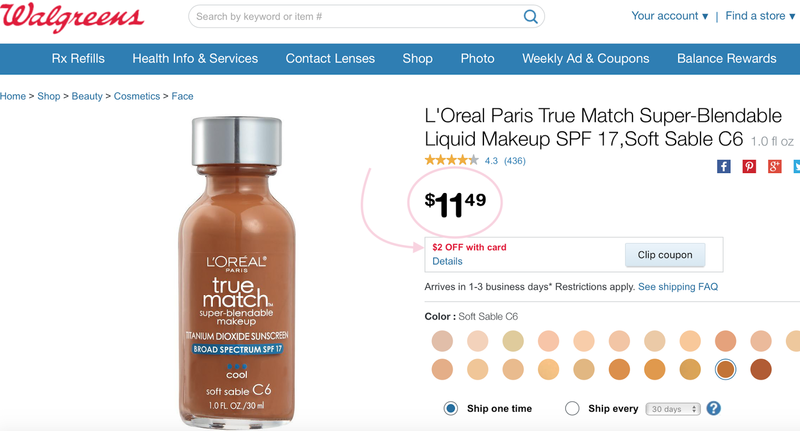 If you don't already know, both Ulta and Sephora have point systems. You build up points with every purchase and can use them to redeem cool stuff aka FREE stuff. I personally think Ulta has the better rewards program of the two [which I will explain why below] but here's how both point systems work. The higher your rank, the easier it is to get points. 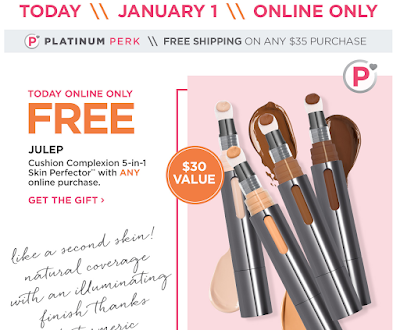 As said above, Ulta also sends out emails when they have point perks. For instance, one day you can get an email saying there is 5x the points on any Tarte purchase. If you spent $100 on Tarte products as the lowest ranked member, you'd earn 500 points. 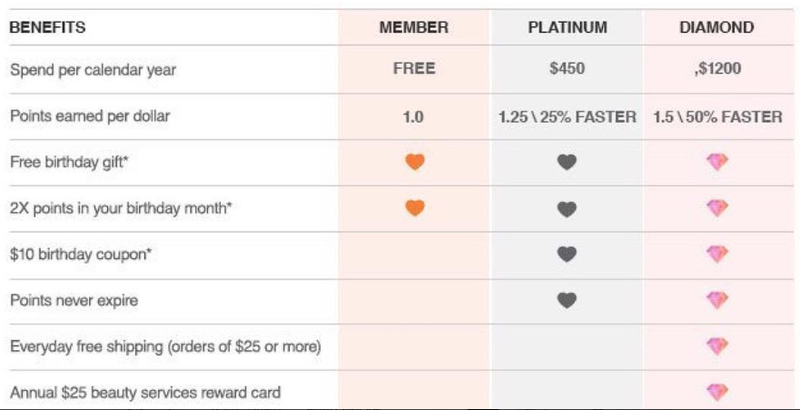 BUT, if you were a top-ranked diamond member, you'd earn 750 points on that $100 Tarte Purchase (1.5 x 100 x 5). So what can you do with these points you ask? 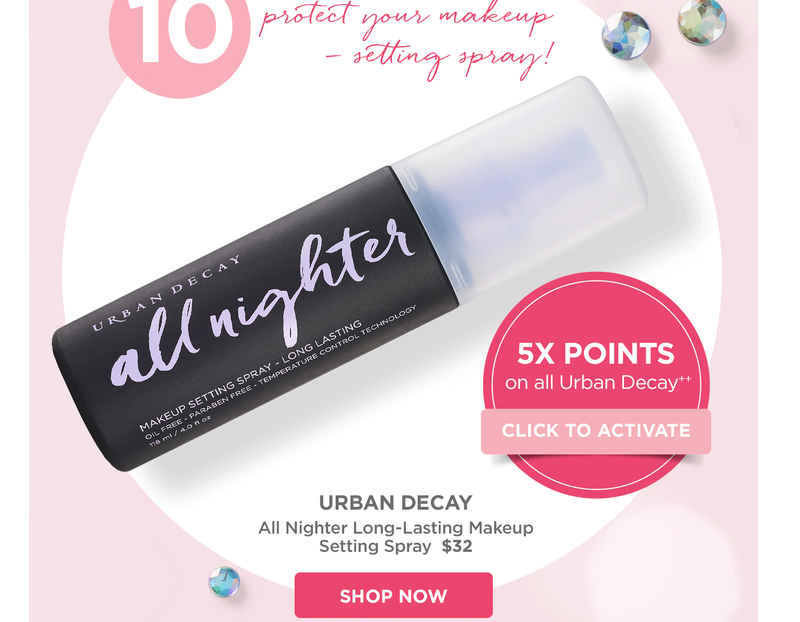 You can redeem them for MONEY to use in Ulta stores and at Ulta.com! This is why I said Ulta's reward program is better than Sephora's. As you can see, not using your points right away and letting them build up is the smarter strategy because you can get up to $125 off a purchase with 2,000 points. That's INSANE! But remember, this doesn't mean you have to spend $2,000 to get those 2,000 points. There are always tons of events and promotions to earn points up to 8x faster. Annndddd cue the stingy again. 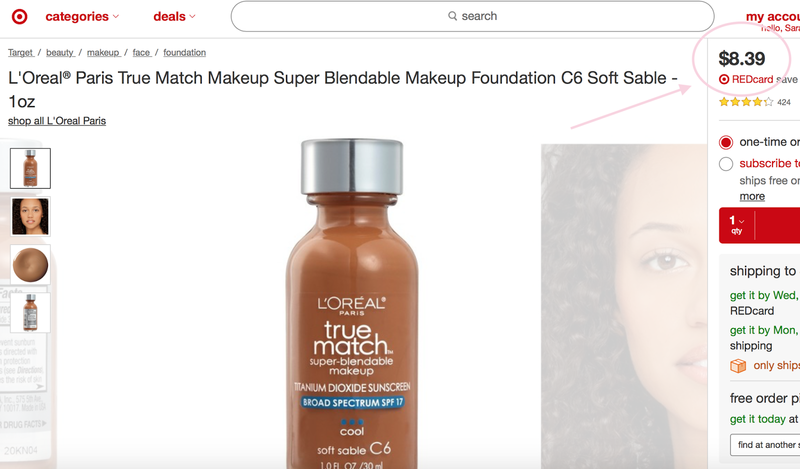 Although Sephora's rewards will never compare to Ulta's, they do offer some type of rewards program. No matter your rank, you earn 1 point for every $1 you spend. OCCASIONALLY, Sephora will do 3x the points on fragrance, but they very rarely offer bonus point incentives. 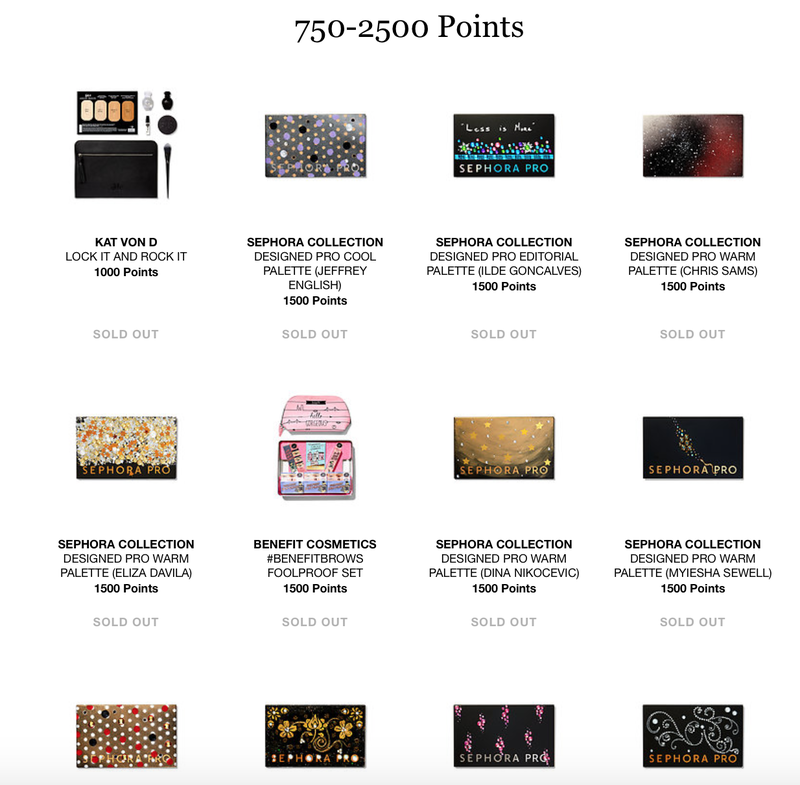 You can redeem your points for 100 point samples, 250 point items, 500 sample kits, 750 point rewards, and then you get up to the 1,000-20,000+ rewards, which in my opinion, are always a little insulting for how much points you're spending for what you're getting. And unfortunately, quite often, the good stuff goes fast and is either already taken off the site, or it just says "SOLD OUT" and you cannot redeem your points for it. They have a $10/month subscription for both men and women. You take a quiz so they can learn what you like, and they personalize your box based on your quiz! You receive 5 deluxe samples and you can rate what you love and hate, so they can learn more about you and improve your future boxes. You can look at previous month's boxes before you sign up on their site so you can see what to expect in your monthly boxes. You get a free gift with signing up. Right now, its a free MAC Lipstick in the shade Velvet Teddy with the code "WELCOMEMAC" at checkout! They give you name brand products [I hate subscription services that give you these weird, cheap brands you've never heard of]. You can shop the full size versions of the products you love and receive free shipping on them. You get $1 in loyalty points when you shop $10 in full sized items that you can spend later! 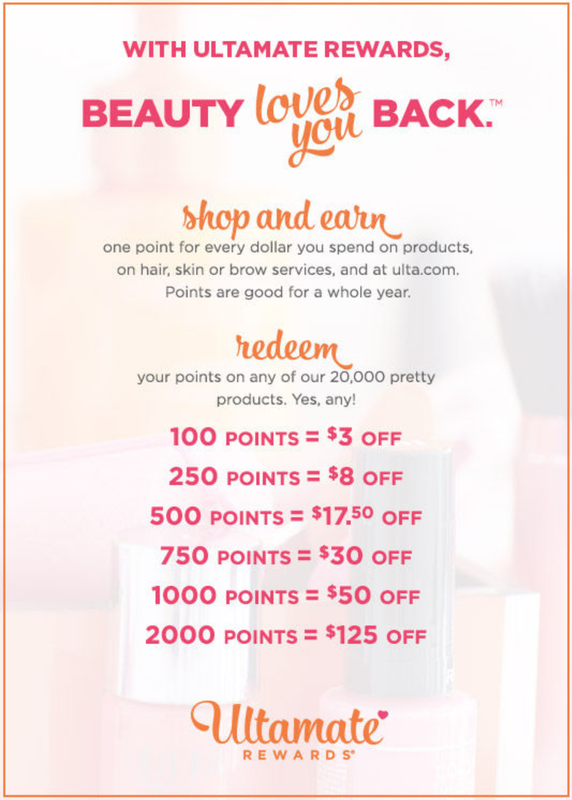 okay I am SHOOK over the Ulta point system.... getting up to $125 to spend in the store makes me want to never shop at Sephora again! I had no clue!! Definitely spending my coins at Ulta!! 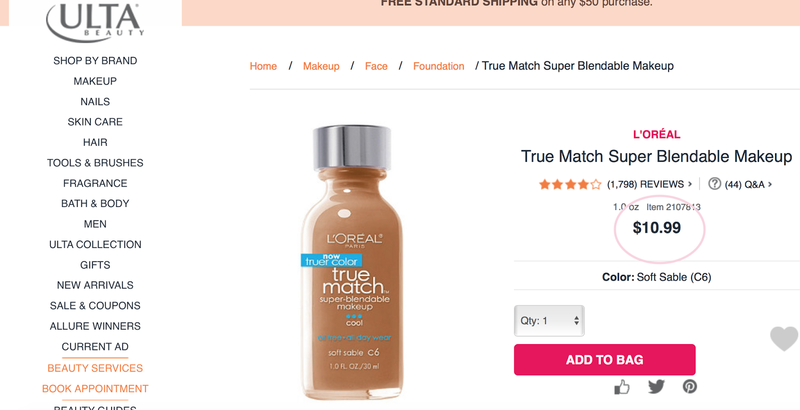 I usually shop at Rite Aid for my makeup so seeing the difference between their prices and Targets is crazy... Ive been paying $14.99 for my foundation when target.com had it for 6.49. i really didn't know they changed their prices that drastically! Such a good read! thanks! One of the best reads I’ve come across this week. Thanks lovely!